South Korea’s Deputy Prime Minister and Finance Minister Hong Nam-ki has asked the US government for an exemption from a new tariff on imported vehicles, the Ministry of Economy and Finance said Sunday. He also met with representatives of major credit ratings agencies, to persuade them to reflect the peninsula’s eased geopolitical risk in their upcoming sovereign rating adjustments. 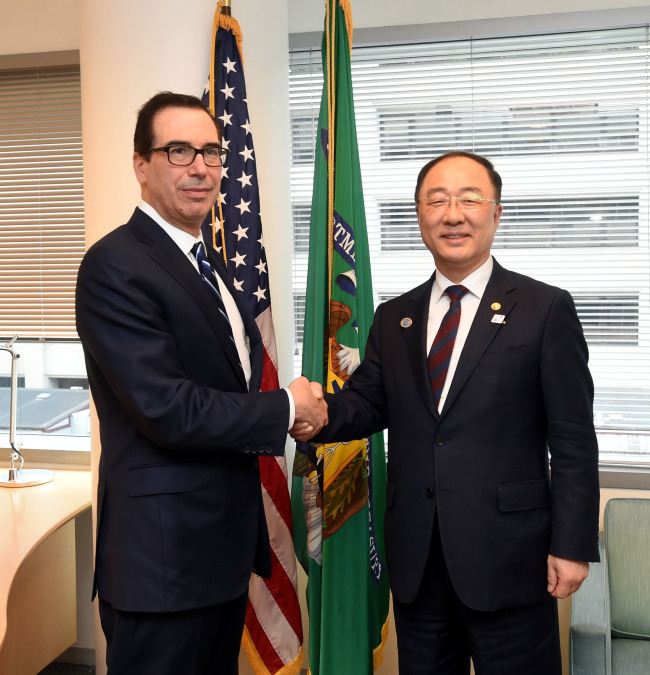 The fiscal chief met US Treasury Secretary Steven Mnuchin on Saturday, on the sidelines of the Group of 20 finance ministers and central bank governors meeting in Washington last week. This was the first face-to-face encounter between the two since Hong took office in December. “I sat with Secretary Mnuchin in a 30-minute, close-door meeting without any attendees,” Hong told reporters. During the occasion, Hong gave a detailed explanation to his US counterpart of Korea’s three major economic agenda -- the US’ Section 232 on auto tariffs, the extension of an earlier exemption from Washington’s sanctions on Iran, and the US’ upcoming foreign exchange report, he explained. Concerning the auto import tariff exemption, Mnuchin expressed hope that the given issues be resolved without difficulty, but also added that no decision had been made on the issue, according to the ministry. The US Commerce Department in February submitted a report to President Donald Trump on the impact of imported cars, a move that may lead to extra tariffs on imported vehicles for national security reasons. During his stay in Washington, Hong also met with representatives of the top three credit ratings agencies -- Standard & Poor’s, Moody’s Investors Service and Fitch Ratings. Citing the recent inter-Korean and US-North Korea talks, he asked them to factor the improved peninsular security situation into Korea’s sovereign rating,. While admitting the slowing trend in the semiconductor sector and other uncertainties for Seoul’s economy this year, the minister added that exports would recover in the second half. When asked about the impact of the country’s minimum wage hike, he explained that a revision bill concerning the wage system is currently under discussion at the National Assembly. In his respective encounter with recently-named World Bank President David Malpass and International Monetary Fund Managing Director Christine Lagarde, Hong asked for active support in the forthcoming economic development on the peninsula. He also explained that Seoul is drafting a supplementary budget bill to respond to downside risks, as the IMF had recently recommended.